Engineering is involved in almost every aspect of daily life, from access to clean water to the development of cutting edge biometric devices. At the University of Tasmania, we are conducting research and producing engineering graduates to take on the world’s greatest challenges, and build a better world for everyone. Studying engineering gives you the most direct opportunity to shape the future, provide higher standards of living around the world, and protect the environment. Renewable energy, safe and efficient transport, sustainable cities and workplaces, and management of the environment are all the responsibility of engineers. Our qualifications are recognised around the world, allowing you to discover a passion, and let it take you anywhere you want to go. Simon Younger has travelled the world with his engineering degree. Listen to his story and see where engineering might take you. Our undergraduate and postgraduate degrees combine theory and practical learning, industry experience, and extra-curricular activities to produce Internationally recognised graduates who can take their skills all over the globe. Our graduates are both technically skilled and professionals who understand the needs of business and society. Fully accredited by Engineers Australia and internationally recognised via the Washington Accord, we offer a study experience that is hands-on, high tech, multi-disciplinary, and prepares you to step into an exciting career in engineering. We are the top provider of applied and exploratory engineering research and development in Tasmania, with industry connections reaching back decades. Our strengths reflect the sustainable yet dynamic nature of our state, and lay in alternative and renewable energy systems, including hydro and wind-power, high-speed catamarans, and biomedical implants. The School of Engineering at the University of Tasmania is an active player in community engagement through STEM education. We have strong long-term interests in playing a central role in increasing the number of girls and students from low SES, regional and rural communities who are well equipped to take up STEM studies and careers. Our mission is to advance research in the area of renewable energy and power engineering in Australia, promote strategic cooperation between the University of Tasmania and Tasmanian Power Industries in the area of renewable energy and power engineering research and establish the University of Tasmania as a world class research institution in the area of renewable energy and power engineering. The Discipline of Engineering is the home of the UTAS Motorsport team. 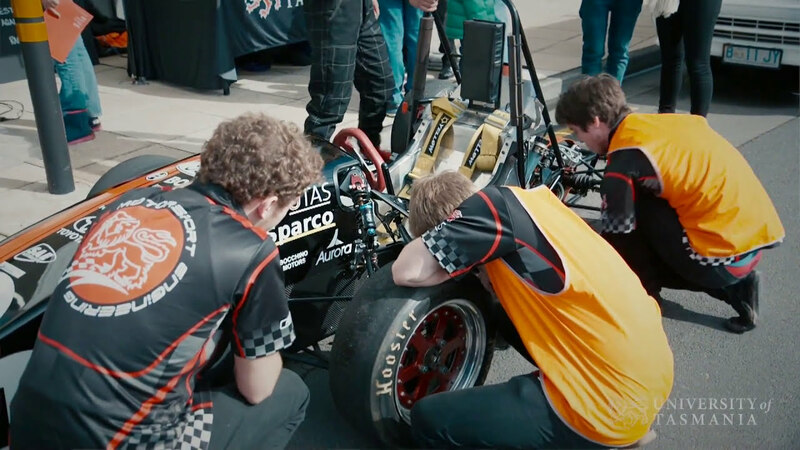 The team is comprised primarily of undergraduate students and is responsible for designing, manufacturing and racing a fully functional formula-style racing vehicle for competition in the internationally renowned Formula SAE competition. It’s the ultimate industry oriented, practical experience opportunity for you to incorporate into your studies.